My starting point has been this exhibition itself. Having no time for undertaking textile projects in the past couple of years due to family illness, I found the upcoming exhibition to be a welcome catalyst for my beginning to work again. I spend some time each year on the West coast of Scotland, in splendid isolation, and am able to absorb the landscapes and seascapes, colours and light – and wanted to create an impression of these effects. 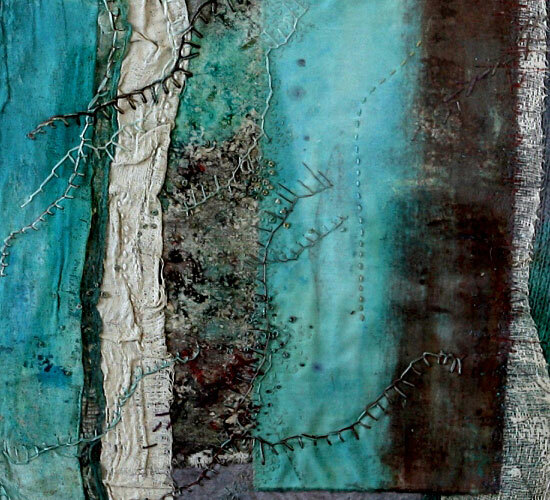 I used open and closer-woven fabrics and painted and plastered them to suggest the textures and erosion found on the shoreline. 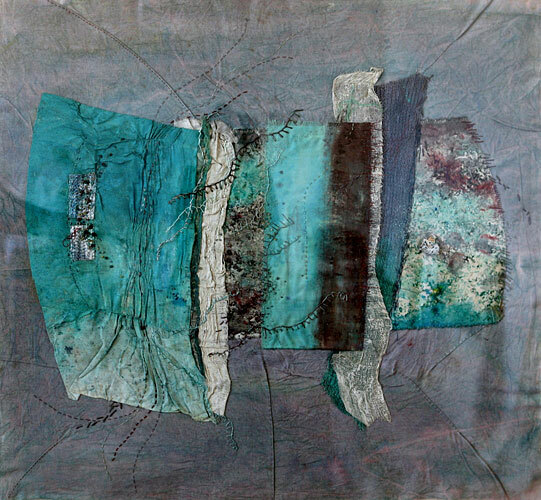 The layers of fabric can represent sea movement as well as the different surfaces found as one walks up a sandy or stony beach. Folds, tucks and stitching were added, echoing the patterns in the sand left by the sea, and strata in rocks.